Wednesday, March 13 7:30 a.m. - 4 p.m. IDEA Testing (pre-registration required) 8 a.m. - 5 p.m. General Registration 8 a.m. - 5 p.m. Educational Workshops 8 a.m. - 5:30 p.m. 2-Day Schools - Day One 9 a.m. - 5 p.m. IDEA Train-the-Trainer Thursday, March 14 7 a.m. - 5 p.m. General Registration 7:30 a.m. - 4 p.m. 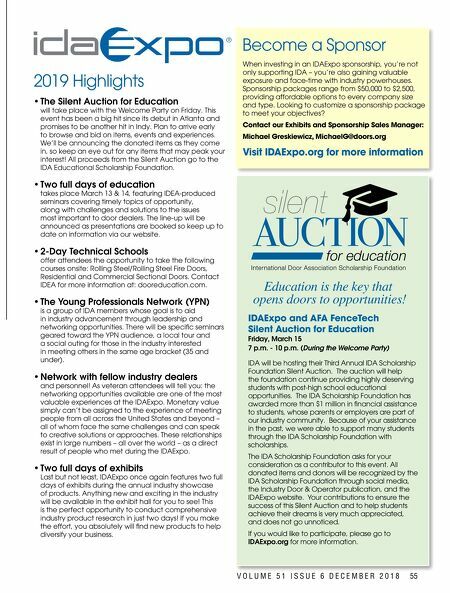 IDEA Testing (pre-registration required) 8 a.m. - 11 a.m. 2-Day Schools - Day Two 8 a.m. - 4:30 p.m. Educational Workshops 1 p.m. - 5 p.m. Certification Testing for Combined Two-Day School Attendees 7 p.m. - 9 p.m. President's Awards Banquet Friday, March 15 8 a.m. - 5 p.m. General Registration 8 a.m. - 8:30 a.m. IDA Annual Meeting of Members 8:30 a.m. - 10 a.m. Opening Session 10:45 a.m. - 5 p.m. Exhibits Opening Day 7 p.m. - 10 p.m. Welcome Party 7 p.m. - 10 p.m. Silent Auction (During the Welcoming Party) Saturday, March 16 8 a.m. - 10 a.m. IDEA The SuperTech! 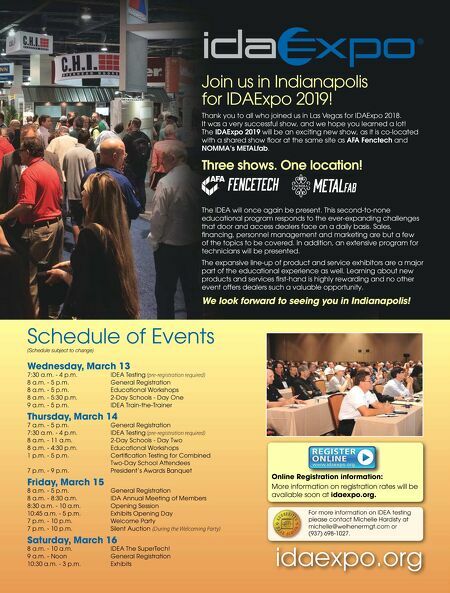 9 a.m. - Noon General Registration 10:30 a.m. - 3 p.m. Exhibits Schedule of Events idaexpo.org (Schedule subject to change) Join us in Indianapolis for IDAExpo 2019! For more information on IDEA testing please contact Michelle Hardisty at michelle@welhenermgt.com or (937) 698-1027. Thank you to all who joined us in Las Vegas for IDAExpo 2018. It was a very successful show, and we hope you learned a lot! The IDAExpo 2019 will be an exciting new show, as it is co-located with a shared show floor at the same site as AFA Fenctech and NOMMA's METALfab. Three shows. One location! The IDEA will once again be present. This second-to-none educational program responds to the ever-expanding challenges that door and access dealers face on a daily basis. Sales, financing, personnel management and marketing are but a few of the topics to be covered. In addition, an extensive program for technicians will be presented. The expansive line-up of product and service exhibitors are a major part of the educational experience as well. Learning about new products and services first-hand is highly rewarding and no other event offers dealers such a valuable opportunity. We look forward to seeing you in Indianapolis! Online Registration information: More information on registration rates will be available soon at idaexpo.org.